Nicholas Mosse’s Teapots make the perfect addition to your collection of kitchen pottery! After all, their Irish Potters put each one through a 20 step hand-crafting process to ensure the classic design is as durable as they are delightful. 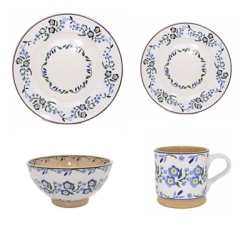 As a result, they’re perfect for any occasion, whether serving tea for two, or entertaining guests during an afternoon tea! 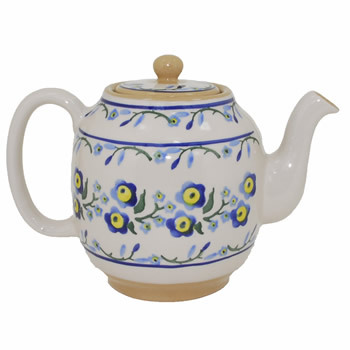 The teapots also make great pottery gifts, simply send to a loved one to make their day! The Forget Me Not Pattern is inspired by the Irish countryside, using vivid shades and an intricate design to recreate the floral beauty. Avoid rough handling and sudden changes in temperature as this may cause the appearance of fine lines on the surface known as crazing. Crazing does NOT affect the life or the usefulness of the pottery.